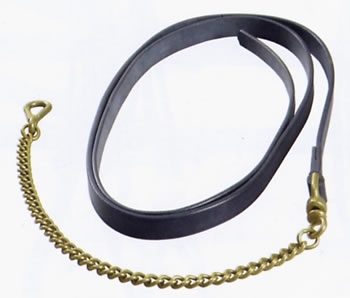 Lightweight Leather Lead Rein with Brass Chain End. This medium weight cavesson from E. Jeffries may be used for either lunging or breaking horses. It is made from high quality bridle leather and is available in havana brown only. The padding is approximately 1 inch thick and is made of foam rubber. This cavesson is available in cob and full sizes (choose form pull down menu.) It is shown here with the Tubular Web Lunge Rein CE-LUWL.